Almost two months ago, I wrote a series of posts (Dollar Down, Everything Else Up and Dollar Down, Gold Up) with self-explanatory titles. Last week, the Wall Street Journal finally got around to covering this story, and were able to quantify the extent of the trend with the use of statistical analysis. Accordingly, they observed an incredible 71% correlation between the Dollar and the S&P 500, compared to an average correlation of 2%. This implies that every 1% rise in the S&P is matched by a .71% fall in the value of the Dollar, and vice versa. Furthermore, this trend appears to be both strengthening and spreading. The average correlation between the Dollar and stocks since July is 60%; given that it’s now 71%, this suggests that it was closer to 50% over the summer. In addition, the correlation between stocks and oil has touched 75%, the highest level since 1995. By extension, this implies a proportionately high correlation between the Dollar and gold. In short, the notion that as the Dollar is tanking, virtually every other commodity/asset under the sun is rising, now has some weight behind it. Understanding the basis for this relationship is not complicated. You can think of it in terms of the Fed’s liquidity program or in terms of the carry trade, but regardless of what you call it, the concept is the same. Basically, the Federal Reserve Bank has printed nearly $2 Trillion as part of its quantitative easing program. For better or worse, most of this money found its way into the markets, rather than into the economy. Investors have been faced with the dilemma of either holding the currency in cash or investing it. (Here, I would argue that “speculate” is a more appropriate descriptor than “invest,” but anyway…) The simultaneous rise in stocks, bonds, emerging market currencies, commodities, and even real estate is proof enough about where that money went. Stepping outside of forex markets a moment, the fact that all asset prices are rising in unison suggests that a new bubble is forming. Normally, one would expect that in a bull market, some assets would outpace others, but in this case, it seems that fundamentals are being pushed to the backburner, and investors are piling into anything and everything that’s liquid. Even traditional relationships, like that which leads bond prices to fall as stock prices rise seems to have broken down. Getting back to the Dollar, the fact that bubbles are forming in stocks/bonds/commodities probably means that an inverse bubble is forming under the Dollar. One can draw understanding from last year’s partial collapse of the Yen carry trade, which began to deflate after several reliably strong years. The same could very well happen to the Dollar carry trade. If and when the Fed raises interest rates, and/or begins to draw the excess liquidity out of the markets by offloading its inventory of securities, well, the markets should witness a simultaneous correction. How violent the correction is depends largely on the degree to which the markets anticipated it as well as the finesse of the Fed. If everybody rushes for the exits at the same time, it could create the same kind of panic that ensued after Lehman Brothers went bankrupt, whereby asset prices collapsed and the markets flooded into the Dollar. History is never far from repeating itself. Very interesting insight. The “Black September” theory of falls in stocks in September didn’t happen. Do you have an estimation of when this bubble you’re describing will burst? Can you give an example of where into the economy the money should go? Infrastructure? IDF? Aid? If they built jet fighters, Boeing and General Dynamics would go up (market). If they built a new port a port builder would go up (market). If they built schools, the builder or whatever would go up (market). Market is the economy. Get a freaking clue! My question is when this collapse of the market happens will the dollar rebound? It happened last time (deleveraging, they called it) and won’t happen this time. History tends to repeat itself, but then there’s one that says those that forget tend to repeat history. So, co-relating the 2 theories (since we are talking corelation) and since the last time is still fresh and we haven’t forgotten, it won’t happen this time. Maybe in 3-5 years. There is a lot of interest in correlation at the moment. As a matter of fact. Correlation occurs in the currency world too. You see a situation where EU/USD is on the rise by 90% and at the same time US/CHF in the te descendency by approximately the same percentage. It calls for further study though. 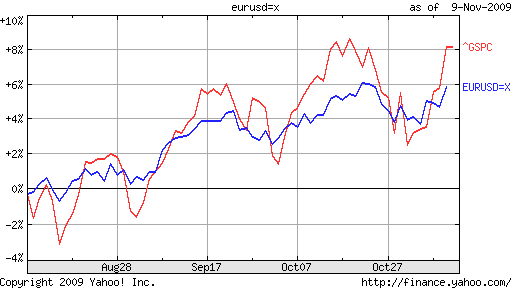 Hello, very good analysis, one of the best examples is the negative correlation that the NFP report has every month, for a moment is the NFP is smaller than the expected, the usd goes weak, and viceversa. Of course the big question as the other guys say is when wil it break down?, and how deep will it be the correction?